Euro Plastic Stacking Containers - 2A021. These European standard sized stackable boxes are available from stock in a range of colours including red, blue and grey. Effective solutions for storage, handling and distribution applications these plastic stacking crates are ideal for stacking onto Euro sized plastic pallets as they utilise all of the available space. Ideal for a huge range of different industries these colour coded plastic containers are manufactured from food grade polypropylene. Used throughout the food manufacturing and food processing, pharmaceuticals and healthcare, retail distribution and industrial storage, recycling and engineering industries, the plastic stackable crates are hygienic and able to stack, saving on storage space. Compatible with our plastic Euro dolly, the RM91DY, these colour coded stacking boxes can be safely and securely handled in large stacks. 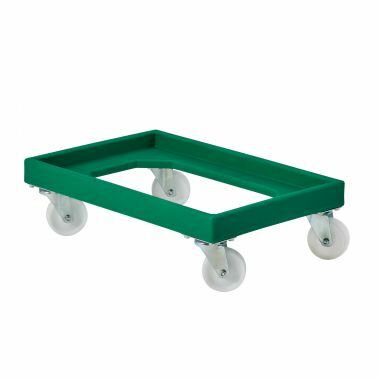 The RM91DY 600 x 400mm plastic dollies are available in a wide range of colours to aid with colour coding. The Euro sized footprint of these plastic crates also enables them to stack efficiently onto standard Euro plastic pallets, making sure they utilise all of the available space. The 2A021 plastic stackable boxes have a solid base and sides enabling them to be easily cleaned and maintained, suitable for industrial application. 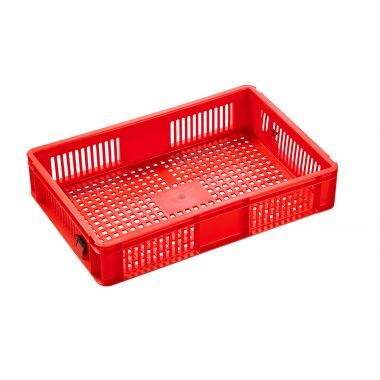 Used throughout a number of industries within storage and materials handling applications these durable plastic crates are manufactured from food grade polypropylene. The food grade tubs are ideal for the likes of food manufacturing and food processing where they are used for storage and handling of food ingredients and food produce, pharmaceuticals and healthcare for distribution and storage crates, recycling and industrial storage; and engineering and retail distribution to name a few. 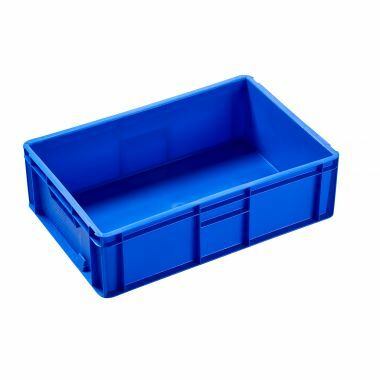 Available from stock in a range of colours, these plastic stacking trays are part of a large variety of Euro-sized plastic containers all exhibiting a standard European footprint. Working hand in hand with standard Euro sized plastic pallets, the European stackable boxes are able to stack efficiently onto the pallets, utilising all of the available space. This stacking attribute makes the colour coded plastic crates ideal for distribution, import and export applications as they can be easily transported and stored without taking up any unnecessary storage space, ideal when space is at a premium. The Euro stacking containers can be supplied with drop on plastic lids to help cover and protect their contents, enabling you to store and handle products and goods safely. Produced in food grade, food approved material these plastic stacking trays are well suited for use within food contact and high care environments. Often used as meat trays within the meat processing industry for handling of meats such as poultry, beef and pork, as well as used as fish crates for the storage of fish and seafood, the Euro plastic boxes are ideal for food product handling. Commonly used for handling and storing food ingredients, dry food stuffs and food produce these food safe plastic containers are easily cleaned and very hygienic. The colour coded plastic stackable boxes are available from stock in red, blue and grey, with red often being associated with raw meat and blue associated with fish products within the food industry. To help with the handling and transportation of these heavy duty plastic crates Supertuff manufacture a 600 x 400mm plastic dolly (Euro dolly) that is designed to be hygienic and durable, suitable for industrial application. These plastic dollies (skates) are highly manoeuvrable and prove to be well suited for handling large stacks of European stackable containers safely and securely. Available in a large range of colours to help with colour coding we also supply stainless steel dollies and double dollies for these plastic stacking crates. As part of a huge range of different sizes, formats and colours of colour coded plastic stacking boxes, Supertuff Europe aim to stock a vast amount of Euro plastic storage containers. As proud UK stockists of Schoeller Allibert plastic crates, plastic containers, plastic trays and plastic boxes, we have ample stock to supply you with exactly what you require, fast and efficiently. For further help with product identification and ownership of plastic trays, we provide a bespoke labelling service and printing for these plastic stacking boxes. For more information on the labelling and printing services for these durable Euro plastic stacking containers please feel free to contact our sales team.